LK Design specializes in window treatments design. It could be difficult for you to figure out what product you may need for the function you want. Drapery panels? Roman shades? Or combination? Roller shades or honeycombs? 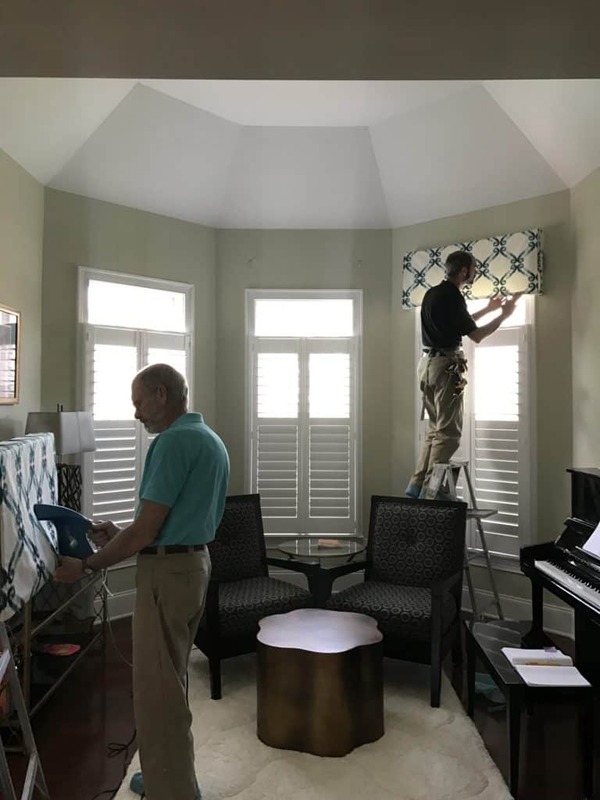 Will shutters limit what you can do with fabric treatments? Do you have challenging architecture and can’t figure it out? We can help. Our process is very simple and is outlined below. We hope you get in touch and we will help you to dress up your windows! Contact form is at the bottom of the this page. We meet to assess your space and architecture of your home, and bounce ideas of what window treatment will work best for your windows. In addition, we talk about colors and patterns, function and budget. 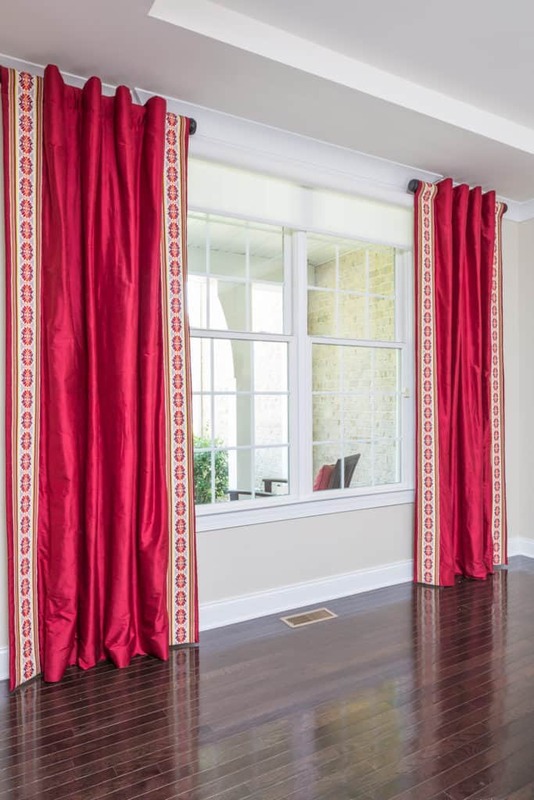 Soft window treatments are made of textiles: drapery panels, many types of shades, valances and cornices. They can serve decorative, privacy and heat/cold control functions. Shades and drapery panels are manually operated or motorized. We select fabrics will that enhance and bring other design elements in your space. Above all, we make it look beautiful! Custom drapery panels frame the window in this Living room. The pattern was created from solid fabrics, colors picked from the décor elements in this room and adjacent areas. Hard window treatments: blinds, shutters, honeycomb shades, roller shades, honeycombs shades. They provide privacy and heat/cold control functions and can be manually operated or motorized. 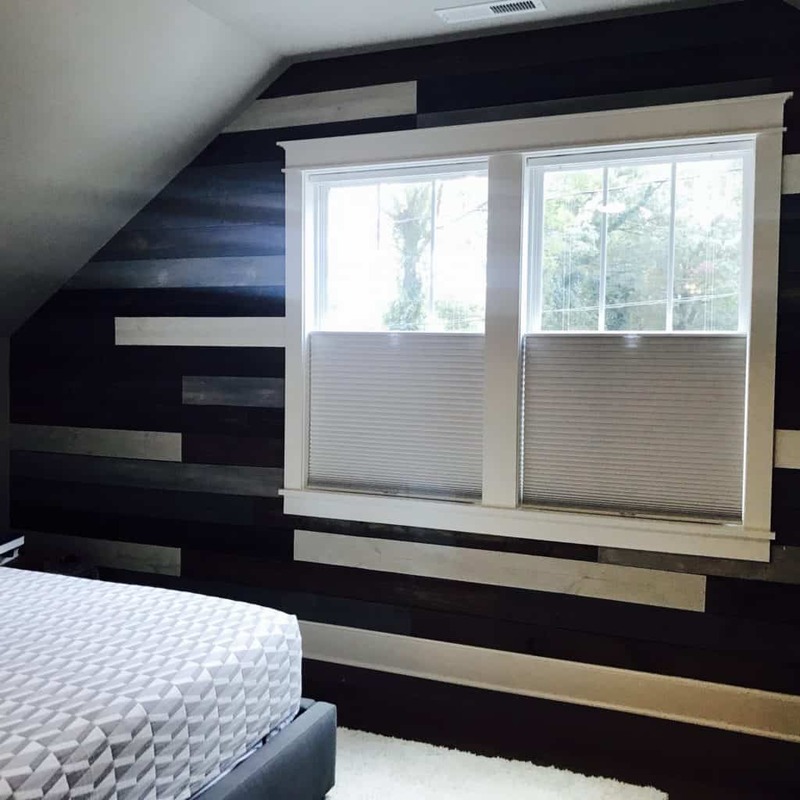 Honeycomb shades with room darkening fabric control the amount of light coming into this modern rustic bedroom. The top down bottom up feature adds convenience and different positioning of the shade. Once our goals are set, we take measurements and photographs, and sign a Letter of Agreement. Next, process of design begins! We carry numerous fabrics and hardware lines to suit variety of color palettes, styles and budgets. It is always fun to be “on a hunt” for the right textile and finish. Consequently, we eliminate frustration of “too many choices” and “can’t decide” situations. One of the local to-the-trade showroom we use to find that one or two perfect fabrics for your windows or even upholstery. For the design presentation, we bring you samples of fabrics and finishes, 2D drawings of what your window treatments will look like. We will make sure it is a perfect fit. It is always a fun meeting! 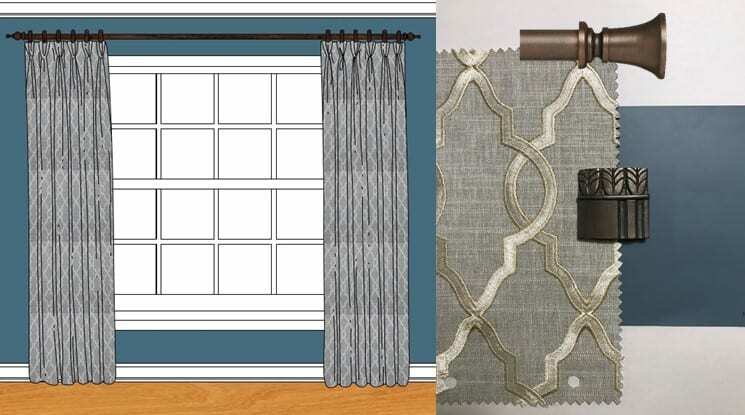 Design sketch and final selections for dining room drapery project. Once we nail it, production process starts as we manage this phase of the project. We strive to design and deliver highest quality window treatments. 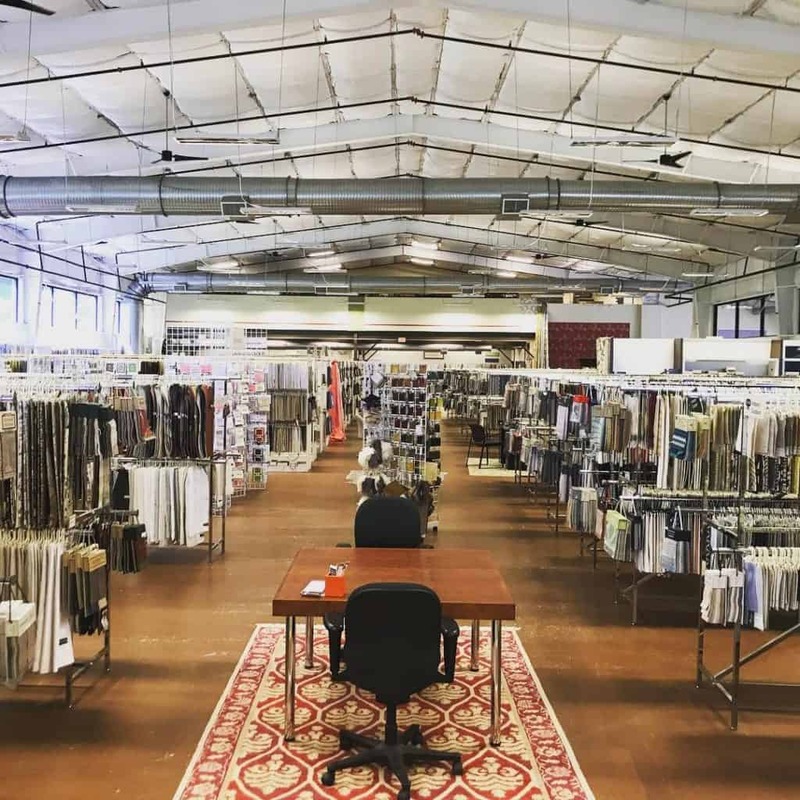 Therefore, we work with professional workrooms, textiles (such as Kravet, Fabricut, Carole Fabrics to name a few) and hardware suppliers to guarantee your satisfaction. Finally, comes delivery and installation day! Again, you only need to be at home to let our crew in. Installer make sure that no wrinkle is left behind! Custom valances in a large scale pattern. All done! Certainly, window treatments are a beautiful finishing element that brings the whole room together, adds softness and richness to the space. For example, we wanted to bring the eye down in this two story room. Therefore, we installed drapery panels right above the bottom row of the windows. The fabric has light background and paisley pattern in multiple colors. It perfectly coordinates with other decor elements throughout the space. 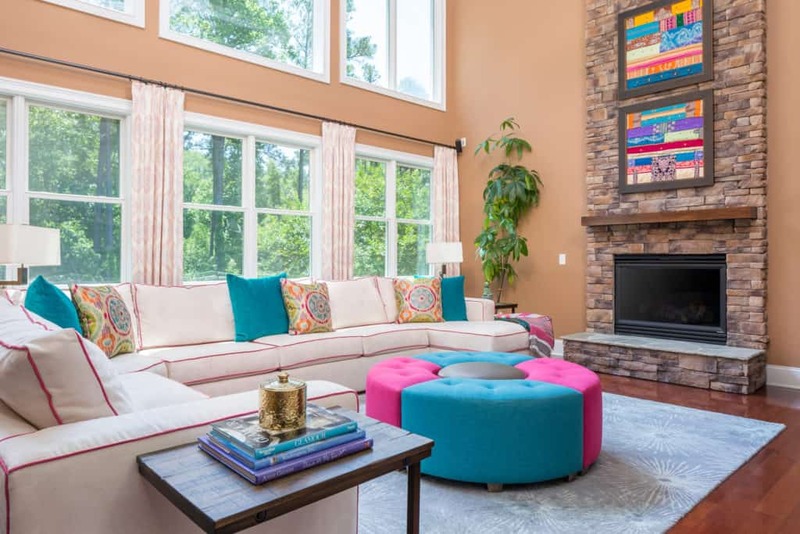 Beautiful, colorful family room. Drapery panels bring the eye down. We picked fabric with light background and a bit of all colors you can see around the room. In this case, we used owner’s banding on the silk panels. Banding had a sentimental value to the client so then we incorporated this element in the room. Best place to apply it was drapery panels! Silk panels are lined with heavy interlining and are embellished with a banding. 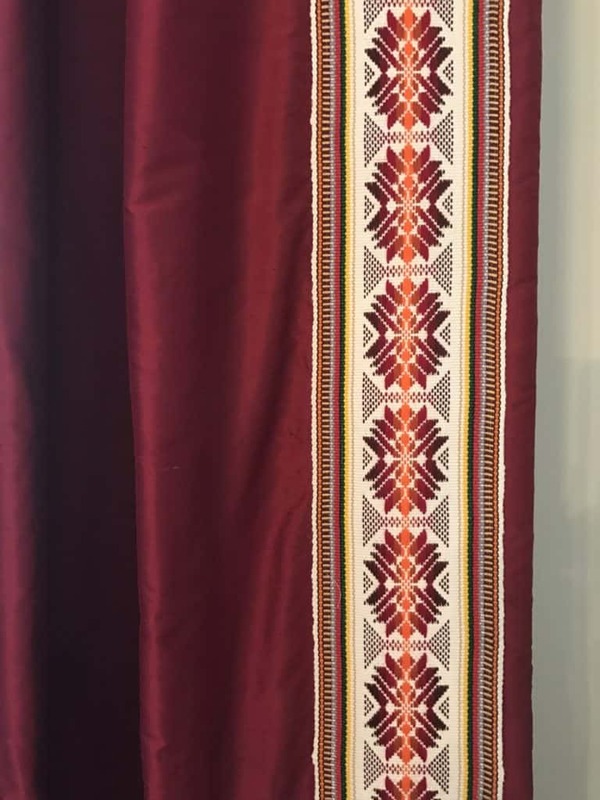 Custom made overseas, this banding adds a very personal touch to the silk drapery panels. Which windows can we help you to dress up? Let’s talk – call us at 919 389 6444 or submit the form below and we will call back soon. Look forward to working with you! 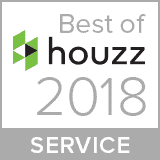 Click here if you would like to be directed to the services page or here to see examples of our work. You can read some of our posts here.